With mercury rising by the day, there is an acute shortage of drinking water in various parts of Hamirpur district these days. Worst affected are the people of upper Bamsan and Bhoranj tehsils of the district. 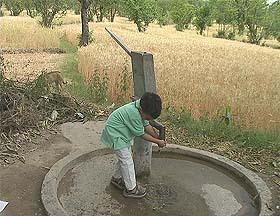 There is an acute shortage of water in most parts of Hamirpur district, a child tries to quench his thirst from a hand pump installed at Kuthera village of Hamirpur district on Sunday. The Hamirpur district of Himachal Pradesh is in the grip of a severe drought this time. Almost 80 per cent of the wheat crop has withered due to scanty rainfall during February and March this year. Rainfall during these months is necessary for growth and maturing of the grains. After about more than two decades after the implementation of the Forest Conservation Act, 1980, the Forest Department of Himachal Pradesh, has asked the Bhakra Beas Management Board Authorities to prepare a catchment area treatment plan for the catchment area of the Beas (upstream of the Pandoh area) to check the flow of silt into Pandoh Dam. Union Agriculture Minister, Rajnath Singh here today criticised what he called a vicious role of the Congress in destabilising three governments at the Centre so it had no moral right to claim that it would provide a stable government. Mr Virbhadra Singh, Chief Minister, has denied that he ever made any derogatory remarks against Mr Atal Bihari Vajpayee, Prime Minister, and said such a rumour was being spread in the media to surcharge the political atmosphere before the Lok Sabha elections. Himachal Tourism Development Corporation’s former chairman Rakesh Pathania yesterday stated that Chief Minister Mr Virbhadra Singh had no moral right to claim credit for the setting up of Dr R.P. Medical College, Tanda in Kangra district. Engine trials on the 16.8-km Una-Chururu section of broad gauge rail line were successfully completed on Friday under the overall supervision of Chief Administrative Officer (Construction) A.P. Mishra and Chief Engineer M.R. Chaudhary. The BJP has described the recent announcements about 18,000 public appointments and future development works to be carried out in the state by the Himachal Pradesh Chief Minister, Mr Virbhadra Singh, during his five-day tour to Chamba district as a violation of code of conduct for elections. The Himachal Road Transport Corporation Employees Federation has taken a serious note of the assault on a driver and conductor of an HRTC bus near Una recently by some miscreant. Mr Rajnesh Sharma, state federation president, in a statement released here yesterday demanded protection to the HRTC staff. The three-day Suhi fair, which started on Saturday, will conclude here tomorrow on the premises of a palanquin-shaped Suhi temple, located on a hillock above Chamba town. The fair reflects the sacrifice by rulers of erstwhile states. Since all natural water sources in these areas have already dried up or about to get dried up, people living in these areas are facing severe water shortage. They are forced to fetch water from khads, where meagre water is still available. People of Sasan gram panchayat located on the Hamirpur-Nadaun highway have threatened to resort to road blockade on April 21 if by then they are not provided with drinking water through tankers. Naresh Kumar Darji, pradhan of the local gram panchayat, said here today that there was an acute water shortage in the area but the authorities were keeping a nelson eye on the situation. He threatened to block roads if the water supply situation was not improved. Sources reveal that the district administration has identified 243 villages, which are likely to face severe water shortage during summer season. These villages will get water through tankers in the first phase of the programme, according to Deputy Commissioner Devesh Kumar. He says the department is seized of the water shortage problem and water will be supplied in the affected areas by tankers. He says the process of calling tenders for tankers will be completed by April 22. Another meeting of the district officers to deal with the water shortage and keep the water sources neat and clean will be held here on April 16, he adds. It was in the month of January that the district had received rain when the entire state had experienced heavy rainfall. After that there were light showers in the region on April 9, which were followed by a severe duststorm and both had caused severe damage to the crops. The Department of Agriculture had fixed a target of producing 62,500 metric tonnes of wheat by sowing the crop on an area of 37,500 hectares. The sowing of the crop was done in two phases. The first phase was completed immediately after the harvesting of the last kharif crop due to the presence of adequate moisture in the soil following heavy rainfall in the area. The second phase of the sowing was done around the Lohri festival on January 13 with the hope that it would help the farmers get bumper crop this time. However, the constant drought conditions since the last January 27 have dashed the hopes of the farmers this time. Farmers are of the view that one or two spells of heavy rainfall in the second or third week of February or March would have saved their crops. 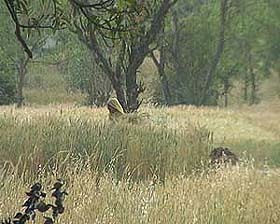 However, now they have started harvesting their crops and starting feeding them to their cattle. A visit to various parts of the district during the past four days revealed that farmers had started harvesting their crops much ahead of the scheduled time. Normally, the harvesting season in the district starts by the end of April every year. However, the sudden change in the climate coupled with the non- arrival of rains and a sharp rise in the temperature has matured the crops much earlier and that too without the adequate formation of grains. Kamla Devi, who was spotted carrying a bundle of harvested crops near Bijheri village on Saturday, was in tears when this correspondent sought her comments about the crops this time. She said,‘‘I have not seen such a situation during my whole of life. The situation during 2001-02 was also not good. But this time, it is worst”. Ram Singh, an ex-serviceman of the Bamsan area said rain god had once again failed the farmers. He said crop this time was not more than 10 per cent of the expected target. A spokesman of the Department of Agriculture admitted loss to the crops. The spokesman was also upset over the constant drought conditions and ill formation of grains. The district administration too is upset over the loss to the wheat crop and has already instructed the field agencies of the Department of Revenue to assess the loss so that the exact figure was communicated to the state government. The HP Chief Minister, Virbhadra Singh, said he was pained over the loss to crops this time in most of parts of the state and especialy in Hamirpur district. Instructions had already been issued to the Deputy Commissioners to make contingency plans so that farmers were given timely help for the next crop. Mr Virbhadra Singh said crop loss was due to scanty rainfall during the maturity time. He said time had come to realise the importance of rainwater harvesting system and to use the tapped water during crisis. He said water was becoming a rare commodity and all efforts should be made to use it with utmost care so that it could be stored for a long period. Meanwhile, farmers have asked the state government to order a special girdwari of the crops and to give them cash relief on pattern of Punjab and Haryana. After about more than two decades after the implementation of the Forest Conservation Act, 1980, the Forest Department of Himachal Pradesh, has asked the Bhakra Beas Management Board Authorities to prepare a catchment area treatment (CAT) plan for the catchment area of the Beas (upstream of the Pandoh area) to check the flow of silt into Pandoh Dam. The Forest Department has asked the BBMB authorities to deposit Rs 72 lakh with the office of the Conservator, Forest circle, Mandi, for plantation in the catchment area of Suketi Khud. As per the provisions of the Forest Conservation Act, 1980, the drawing up of CAT plan is mandatory but when this project was cleared the Forest Conservation Act was not enacted. The authorities have to raise plantation in the catchment areas so that least damage is caused to the environment. The 990 MW Beas Sutlej Project for which water was diverted from the Beas to Sutlej. This water is collected at Balancing reservoir at Sundernagar where the silt is thrown into Suketi Khud, which has been causing water pollution. The problem has been increasing for the past more than two decades as the silt load has been increasing in the catchment area of the Beas upstream Pandoh Dam which ultimately flow into Balh valley through the Suketi Khud and spoil land in the valley. Residents of the area had been raising voice in the past and the National Environmental Engineering Research Institute, Nagpur, formulated an environmental management plan and suggested that the silt load in the Pandoh Dam be decreased. Conservator Forest, Mandi, had submitted a proposal to the government to raise plantation in the catchment area of the Suketi Khud and suggested that the BBMB authorities be directed to formulate a post project CAT plan which is now mandatory as per the provisions of the Forest Conservation Act. Earlier when the project was cleared no CAT Plan was formulated and the Forest Conservation Act was not enacted at that time. This proposal was accepted by the government on August 27, 2003, at a meeting of the state-level steering committee which was headed by Principal Secretary (Science and Technology and Environment). The Principal Chief Conservator of Forests on March 26, 2004, wrote a letter to the Himachal government for complying the direction to deposit Rs 72 lakh for plantation in the Suketi Khud area and initiate action for the formulation of post-project CAT Plan at the earliest. The BBMB authorities, however, clarify that it has not received any communication as yet. Addressing a news conference at Sundernagar Rest House he maintained that the 120-year old Congress party had conceded defeat much before the elections. It had decided to contest the elections on its own at the Pachmarhi session. Later at the Shimla session the Congress reversed earlier stand and opted for alliance. But it had failed to enter into any meaningful adjustment with any major opposition party. He lamented that the Congress had always kept the interest of the party above the national interests as a result of which it had lost the confidence of the masses. The decline of the Congress began when Mrs Sonia Gandhi assumed its control he remarked. Mr Rajnath Singh said it was important in a democracy that the opposition should play a constructive role by criticising the government for its commissions and omissions and appreciating the good work done. The Congress and other opposition parties did not abide by this rule. They criticised for the sake of criticism. “We had supported and appreciated Mrs Indira Gandhi in 1974 when experiment of atom bomb was done. In contrast Mrs Sonia Gandhi criticised Mr Vajpayee for the nuclear test. We are surrounded by atomic powers and it is in supreme national interest to develop a deterrent” he argued. When a correspondent asked how would the BJP develop Himachal if it came to power at the Centre again Mr Rajnath Singh said the Prime Minister was emotionally attached to Himachal and had been bestowing on the state economic packages irrespective of the fact whether the Chief Minister was Mr P.K. Dhumal or Mr Virbhadra Singh. Later addressing a rally at Bhongrotu near here he claimed that during the Vajpayee government tremendous development had taken place on all fronts. India had emerged as the fourth economic power in the world. “Our country is the second in the world for attaining accelerated pace of development in the shortest time” he asserted. He said the country had the all time high foreign exchange reserve compared to the Congress rule when the situation was so dismal in 1994 that the country had been forced to mortgage gold for foreign exchange. He claimed that image of the country had improved in the world and even the developed countries were holding India in esteem. “Our growth rate has risen to 8 per cent as against 1.50 per cent of Japan”, he said. Mr Rajnath Singh said the Vajpayee government had improved relations with neighbours and world powers. Our relations had improved with China, Pakistan, Sri Lanka and Bangladesh. The Muslim world had also come closer to India for the first time after independence due to policies of Mr Vajpayee. He regretted that despite the fact that the Congress enjoyed majority for over 45 years economy of the country deteriorated during its rule, relations with neighbours worsened, poverty increased and unemployment assumed alarming proportions. Mr Virbhadra Singh, Chief Minister, has denied that he ever made any derogatory remarks against Mr Atal Bihari Vajpayee, Prime Minister, and said such a rumour was being spread in the media to surcharge the political atmosphere before the Lok Sabha elections. Expressing his anguish over the charge, the Chief Minister said words which he had never spoken had been attributed to him. It was a crude attempt to belittle his image and mislead people with a view to undermining his successful election campaign. The Chief Minister said the reaction of BJP leaders, especially the Union Agriculture Minister, Mr Rajnath Singh, on the issue was premature and not in good taste. It did not behove them to indulge in mudslinging and firing wild accusations without verifying facts. It seemed that the growing popularity of the Congress had baffled the BJP leaders and they were resorting to such tactics out of sheer frustration, he added. Mr Virbhadra Singh said he believed in clean, conscientious and value-based politics, which had stood the test of time in his long political career spanning over four decades. He said what he had said in a public meeting in the Jaswan area of Kangra was the contribution of successive Congress governments in strengthening public sector undertakings and the way in which the BJP government under the leadership of Mr Vajpayee went for their speedy disinvestment. Himachal Tourism Development Corporation’s (HPTDC) former chairman Rakesh Pathania yesterday stated that Chief Minister Mr Virbhadra Singh had no moral right to claim credit for the setting up of Dr R.P. Medical College, Tanda in Kangra district. He said on the eve of last Assembly election held in 1998 then Chief Minister Virbhadra Singh had announced the setting up of this Medical College by earmarking Rs 50 lakh only. “Such meagre budget for a medical college was a joke with people of Kangra district,” he added. He claimed that it was the BJP government headed by Mr Prem Kumar Dhumal, which came to power in the state which earmarked crores for this college. It was only the Dhumal government which got provisional recognition to this college, he added. He said the Chief Minister could not mislead the people of Kangra district in this connection as they were aware of the fact that the present medical college had taken shape with the efforts of the previous Dhumal government. The Una-Chururu section is the second block section of the 84-km Nangal-Talwara section, which will provide an alternative and shorter broad gauge route for trains running from New Delhi to the Jammu-Srinagar area. While the foundation stone for the Nangal-Talwara section was laid at Amb in this district as early as June 1977 by the then Union Railway Minister Lalit Narayan Mishra, for the sake of implementation, it was further divided into five block sections, Nangal-Una, Una-Chururu, Chururu-Amb, Amb-Daulatpur and Daulatpur-Talwara. Work on the 16.45-km Nangal-Una section formally began in 1983 and was opened for traffic on January 11, 1991. Work on the second section from Una to Chururu began in June 1998 after its formal inauguration by Railway Minister Nitish Kumar. After today’s successful engine trials, is almost ready for its formal inauguration after the General Election. Elaborating on the salient features of the section, Railway Engineer-in-Charge of the section S.K. Sharma said this was the largest block line constructed in Himachal Pradesh after Independence and had been incorporated with six road overbridges and four road underbridges to avoid railway level crossings, minimising safety risks and inconvenience to road commuters. He said Rs 64 crore had been spent on the project, which included procuring 111 hectares of private and 26 hectares of government land. The BJP has described the recent announcements about 18,000 public appointments and future development works to be carried out in the state by the Himachal Pradesh Chief Minister, Mr Virbhadra Singh, during his five-day tour to Chamba district as a violation of code of conduct for elections. Talking to reporters here today, Mrs Ranu Chadha, district president of the BJP, said a complaint to this effect had been lodged with the Election Commission of India. Mrs Chadha said the election rallies of the Chief Minister in the district got a lukewarm response from people. She alleged that the development of the district had been neglected. The Himachal Road Transport Corporation (HRTC) Employees Federation has taken a serious note of the assault on a driver and conductor of an HRTC bus near Una recently by some miscreant. Mr Rajnesh Sharma, state federation president, in a statement released here yesterday demanded protection to the HRTC staff. The president of the federation, which is affiliated to the state INTUC, denied any groupism in the INTUC leadership and termed it to be a difference of opinion. He said in order to strengthen the INTUC in the state the federation had called a state level meeting at Swarghat in Bilaspur on April 18 in which the strategy to strengthen the INTUC and to solve the workers problems would be chalked out. The 1000-year-old Suhi Mata temple at Chamba is an inseparable part of Chamba’s cultural heritage. The temple was erected in the memory of saintly Queen Sunayana. It was the Queen’s sacrifice which brought drinking water to Chamba town at a time when there was acute scarcity of water in the town. With this incident, the Queen set a rare example for the posterity. To commemorate the sacrifice the Queen of a three-day fair is held every year. During the fair, young girls decked in their finest and traditional costumes, sing an elegy called ‘sukraat’ in the local dialect. Sukraat symbolises the very night when water of the Sarotha burn (nullah) reached the town. Mr Harsh Mahajan, Animal Husbandry Minister, along with other noted personalities of the area also visited the holy fair.